When my friend dagdvm first floated the idea of us attending a particular geocaching event that would offer us a chance to bag some terrain rating 5 geocaches, I reluctantly declined her invitation. This wasn’t easy for me to do — we’d had two great geocaching outings so far in recent weeks, in Hemlock Overlook Regional Park and Fountainhead Regional Park, and I was looking forward to our third — but this one sounded a bit outside my capabilities. 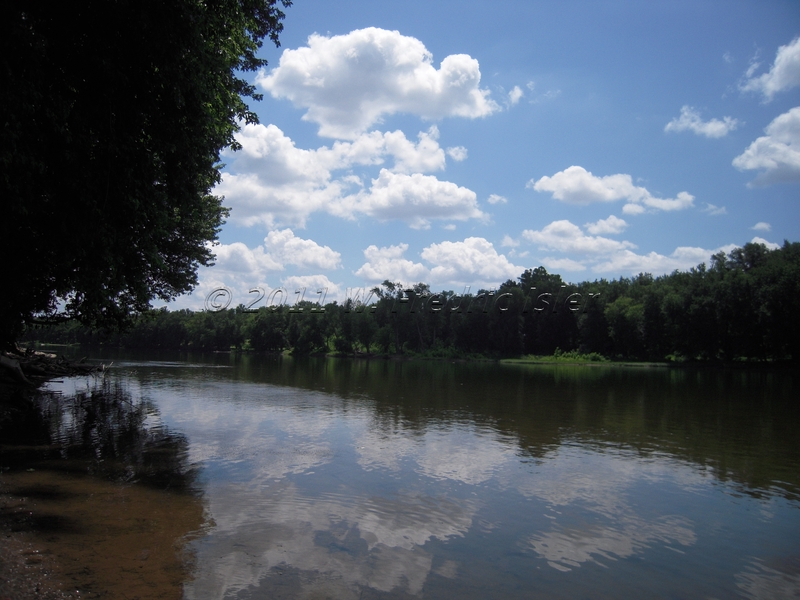 The event called for us to make our way downstream to landfall on the Virginia side of Heater’s Island Wildlife Management Area, hike to the event location in the middle of the island, search for geocaches with our fellow attendees, and then make our way back upriver. I was looking forward to hiking the island, meeting my fellow geocachers and finding the island’s caches, but neither of us had ever navigated in any kind of water vessel and I didn’t know how to swim. However, as July 17th approached the Potomac’s depth dropped to less than three feet on the Virginia side of Heater’s Island. The river was even shallower from Maryland’s Point of Rocks to the northern side of the island. As the river dropped and the current slowed I felt the event’s requirements aligning in a much better way with my nonexistent river skill set. dagdvm borrowed a two-person canoe from a friend, rented a truck to haul it, and we agreed to attend Pirates of the Potomac: Revenge on Heater’s Island (GC2BQ05), a fine geocaching event staged by eXtremeJeep. On July 17th I met dagdvm at the Virginia side boat ramp, the designated Pirates of the Potomac launch point just upstream from the Route 15 bridge. The ramp was a bit less than a mile from the event’s landing waypoint on the Virginia/southern side of Heater’s Island. I’d bought a life jacket for the occasion and brought a cooler filled with iced water. dagdvm had travel-ready food and other essentials in a capsize-proof bag. We unloaded the beautiful green canoe from dagdvm’s truck-for-a-day and brought her to river’s edge. We were two friends with no experience on the water in one canoe with little time to learn to work together to reach our destination. Sitting up front, dagdvm called out the obstacles, the most prominent being a group of rocks just downstream of the Route 15 bridge. Since I was in back I called out the steering maneuvers. I learned to execute a sharp turn by dragging my paddle on one side or the other while asking dagdvm to lift hers. In our obstacle-free moments we paddled in silent unison on opposite sides of the canoe. My stroke was stronger so the canoe would slowly turn in the opposite direction of my stroke side. To keep a straight line under power I’d call for us to switch sides every so often. Not switching sides made for a nice gradual powered turn. The current was moving slowly enough that paddling across it didn’t cause our canoe any problems. Before we’d passed the upstream tip of Heater’s Island we’d already jelled into a team. Spontaneously finding our own way to navigate the calm waters of the Potomac was exhilarating. 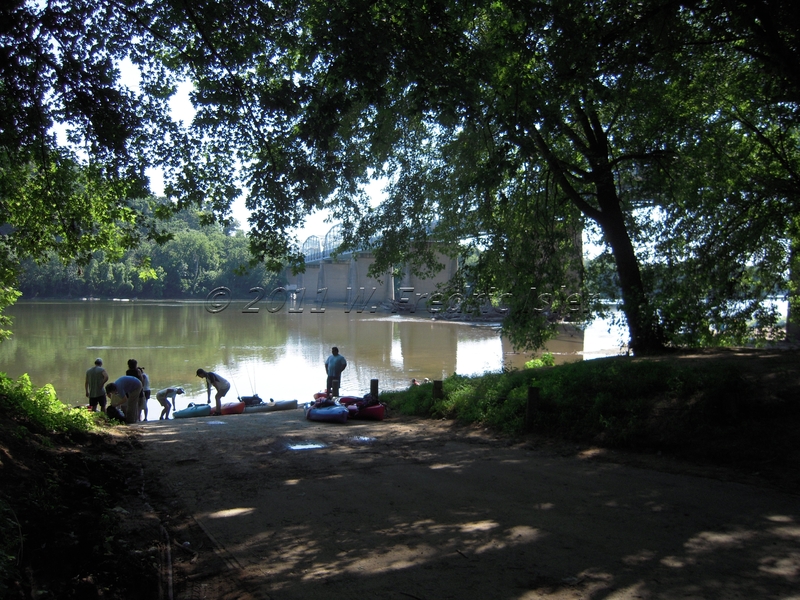 Next, in “Landlubbers Paddle the Potomac, Part 2”: landfall on Heater’s Island; stinging nettles; great geocaches; and our fellow Pirates of the Potomac. 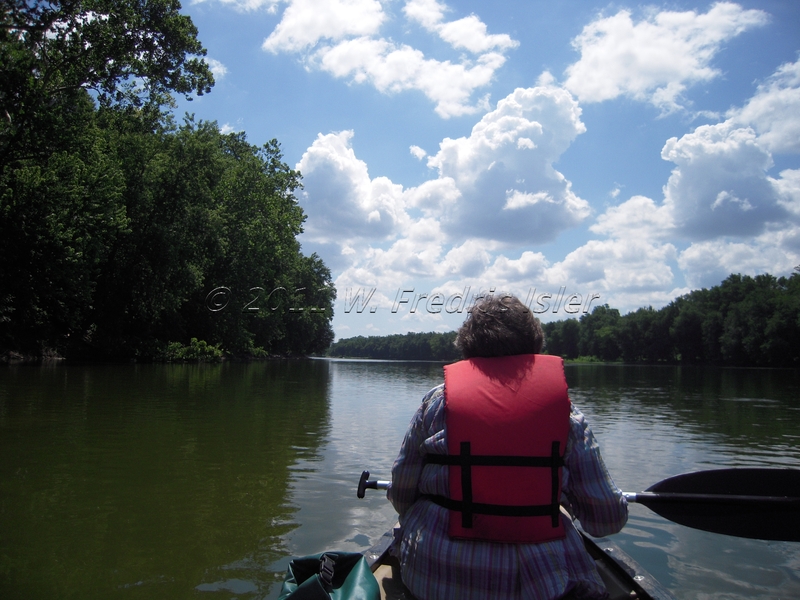 This entry was posted in event, road trip and tagged canoe, canoeing, dagdvm, eXtremeJeep, geocaching, Heater's Island, Maryland, nature, photography, photos, Pirates of the Potomac, Point of Rocks, Potomac River, rowing, travel, Virginia, Wildlife Management Area. Bookmark the permalink.